We love when people visit Roadrunner Florist Basket Express! 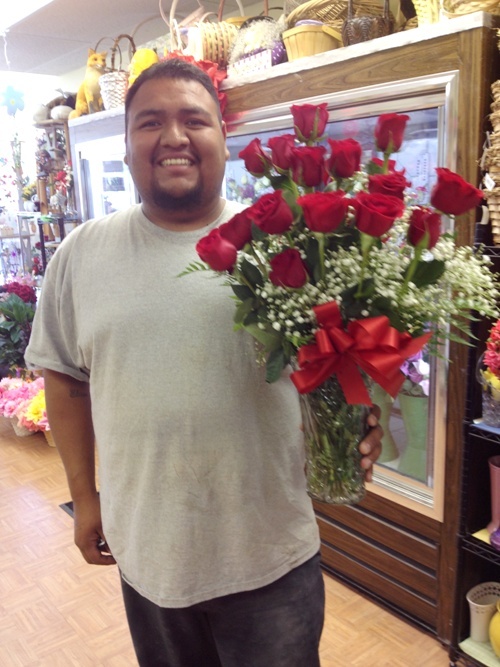 David came into our shop to buy 2 dozen beautiful roses for his wife. Here he, carrying them out of the shop! He looks like one happy guy! Omar’s story is very interesting. 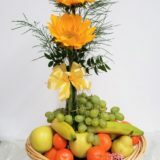 I was at the shop one Sunday designing flowers for a funeral. The door was locked but the lights were on. Omar and his family came to the door and he was carrying the largest candle I had ever seen! They had pictures to show me, and although none of them spoke English, I managed to figure out that they wanted flowers to surround this candle for a baptism. We agreed on red and white roses, lots and lots of baby’s breath, and an hour of my time. When Omar picked up the candle he was one happy uncle! Prom season is over in Phoenix! 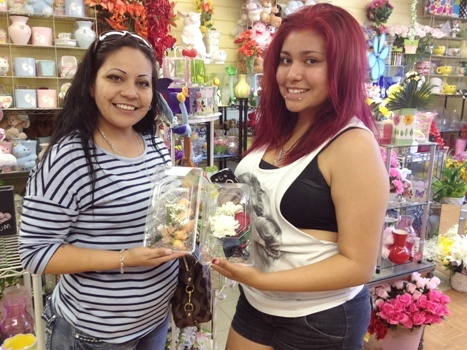 These 2 ladies loved the corsages we designed for them. We love it when other florists drop by! 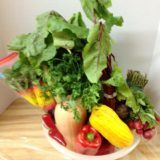 This one is from Beaverton Florist in Oregon. They came into our shop after enjoying a lunch at the restaurant next door. He purchased one rose, which Pamela wrapped with greens and baby’s breath, and I handed it to him. He then handed it to her! That was one of the nicest gestures I’ve seen in a long time! 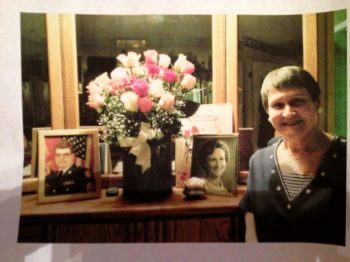 For their wedding anniversary, her husband ordered these beautiful pink roses. He was kind enough to send us this picture of Marthanna standing in front of them at her home. Cheryl brought her family in to pick up her wedding flowers she had ordered from Roadrunner Florist. They loved them! 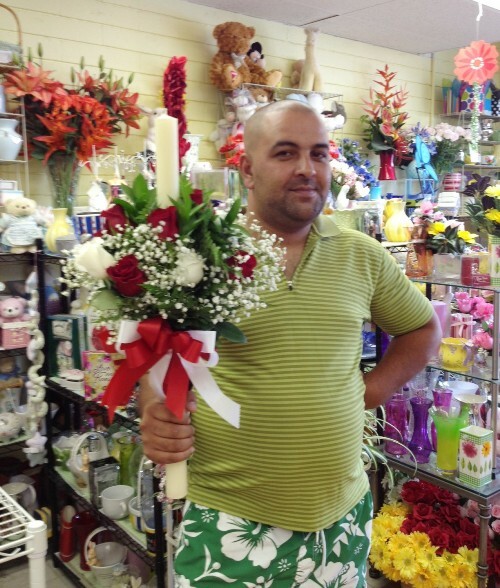 YOU can join the gallery of People Visit Roadrunner Florist Basket Express! Simply come into the shop, introduce yourself and let us take your picture with your beautiful flowers or gift basket! This is so great that you talk about your clients on a blog post. I love this! Thanks< Carele! I love it when people come into the shop and allow us to take their picture! Tina- An awesome tribute to your customers. Fabulous idea to show their happy faces with their order. Have you put a sign up in the shop asking them to pose &/or a card in their order? I always love looking at a gallery of photos that you usually see in baby Drs offices or Vets because we all ooh and ahh over babies nd pets. But PEOPLE and FLOWERS- happy smiling faces- better than good! Roslyn, I never thought about putting up such a sign, but it’s a great idea! What usually happens is we ask a person at the time, or if they’re with someone else and pictures are being snapped, we join in the fun!! This is great! 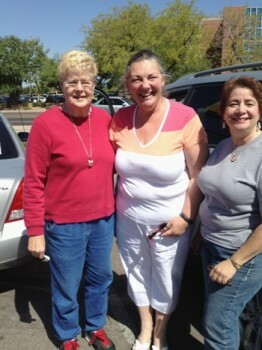 Sharing customer experiences of so many who walk out happy is so nice! I enjoyed this, thank you for sharing. Thanks, Meryl. I think it’s important that people realize we are a real flower shop (as opposed to an online-order-gatherer) and we want people to know our customers are happy when they leave our shop. How lovely that you put a face to the customers who get to buy and share your beautiful flowers, Tina. Fun to see the variety of people who stop by and what they actually choose. A wonderful study in human nature. Thanks, Beverley!! 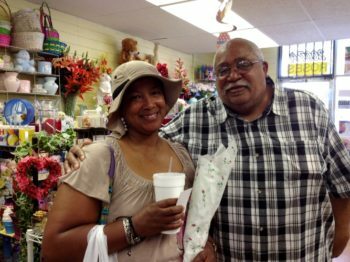 We love telling stories of our customers, and yes, I’m already making a photo album of more people who have come in and left with beautiful flowers and gift baskets. Thanks, Alexandra. 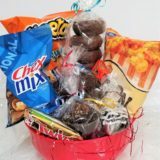 We love the personal touch that our flowers & gift baskets convey to people. It’s always important to recognize your customers and letting them know about how you feel about them. What a great story about Omar. Thanks for sharing that! I LOVE, LOVE, LOVE, LOVE, LOOOVE that you are engaging with your customers. I have tried so many times to get people to do this in their marketing and for whatever reason they just do not. I’m posting this on our social media pages as an example of what to do! 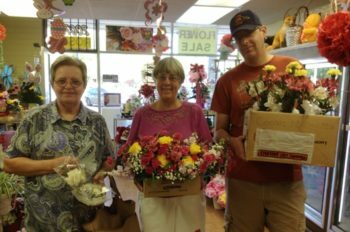 Tina, these pictures and stories clearly show the joy your floral creations bring to all sorts of people. You have talent and opportunity! This is such a great idea, I went through every pic! It’s such a fun way to see who you service and how it makes them feel seeing their faces 🙂 awesome idea Tina!